Bishop Thomas Connolly died April 24. 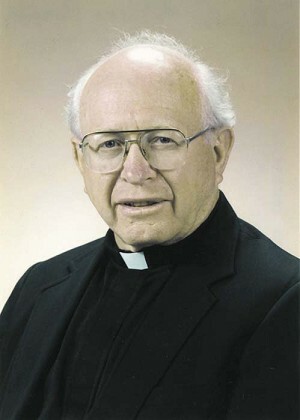 BEAVERTON — Bishop Thomas Connolly, longtime spiritual leader of Eastern Oregon’s Diocese of Baker, died April 24 at age 92. He had lived at Maryville Nursing Home since 2011. A vigil is set for 5 p.m. Wednesday, April 29, at the new St. Francis Church in Bend. A pontifical requiem Mass starts at 11 a.m., Thursday, April 30, at the new St. Francis in Bend. The pontifical Mass of Christian Burial is set for 11 a.m. Friday, May 1, at St. Francis de Sales Cathedral in Baker City. Over the years, Bishop Connolly took to horseback to help ranchers bring cattle to winter pasture. He drove between 30,000 and 35,000 miles per year in his spread-out diocese. He was born and raised in Tonopah, Nev. and attended public grade school. His second home was St. Patrick Church in Tonopah, where he was baptized, received first Communion, was confirmed and eventually was ordained a priest. He received seminary education at St. Joseph College and St. Patrick Seminary in the Archdiocese of San Francisco and was ordained by Bishop Thomas Gorman of Reno in April 1947. He served as an assistant pastor, a teacher and chaplain for the Serra Club, a group that promotes vocations to the priesthood and religious life. In 1949 he was enrolled at the Catholic University of America in Washington, D.C., where he obtained a license in canon law. He attended the Pontifical University of St. John Lateran in Rome from 1951 to 1952 to earn a doctorate in canon law. In 1952 he returned to the Diocese of Reno, then under the direction of the Bishop Robert Dwyer, who eventually became archbishop of Portland. Father Connolly served as assistant pastor and pastor at parishes in Reno and Elko. In 1968 he was named pastor of St. Theresa Parish in the state capital, Carson City. Bishop Connolly, the record shows, was more than a priest in the parishes he served. He sometimes took up a hammer and saw when needed. He oversaw building of a new church and rectory in Elko as well as a mission church. In Reno, his efforts resulted in the construction of a church, school, rectory and convent for St. Albert the Great Parish and the student center at the University of Nevada. During his decades in Nevada, Bishop Connolly chaired the Reno Diocese Building Commission, moderated a Catholic women’s group, moderated the Italian Catholic Federation, directed the Cursillo movement and served as state chaplain of the Knights of Columbus. In 1971, at age 49, Father Connolly received news of his appointment to Oregon from Reno’s Bishop Joseph Green. He was the first native of the Diocese of Reno actively serving in the diocese to be appointed a bishop. Among his proudest accomplishments in the Diocese of Baker was the DeSales Education Program, faith formation for adults that was used in more than 7,000 parishes in the United States, as well as overseas. The diocese produced videotapes. He also valued an annual three-day youth rally. He testified for the poor at the Oregon Legislature and started a program that helped Hispanic men prepare for the permanent diaconate. The worst part about being a bishop, he said, was balancing justice and charity when handling personnel. After retirement, Bishop Connolly led retreats around the region. In later years, he suffered memory loss. His favorite scripture passage was Luke 7:36-50, in which the sinful woman washes the feet of Jesus with her tears and them dries them with her hair. She forgives her sins. “It reveals the Jesus that I love,” he said. Bishop Connolly was a good friend and humble, down-to-earth man of God who served well the Lord's people. May he now have all his good memories and friendships restored in the heavenly kingdom. This comment has been hidden due to low approval. Bishop Connolly was a big reason I began a career within the Church in 1977. Together with my pastor Father Conway, the bishop formed me in ministry. They were both with me when I caught my first steelhead. I have a special place for those good & holy men in my heart! Peace be yours my Mentor! This comment has been hidden due to low approval.